The power supply to St Francis Bay and Cape St Francis will be interrupted this coming Thursday, 26 October. Eskom had originally advertised the outage for 7 September but postponed the work to the alternative date, 26 October. The power outage is scheduled for 9am to 4:30pm at St Francis Bay and Cape St Francis. The good news is that the power will not be off for the entire duration to all areas. Residents and business are, however, advised to have contingency plans in place as it is difficult to predict which areas will be affected and for how long. Due to inclement weather, the work could not be done yesterday. “We ask residents to treat all electrical points as live during this period, said Mayor Elza Van Lingen. THE Kouga Council will be creating temporary drop-off sites for garden refuse at St Francis Bay. Kouga Executive Mayor Elza van Lingen said plans to create a drop-off site along Tarragona Road on erf 3143, as proposed by the previous Council, had failed to meet the requirements of the Department of Environmental Affairs. “This process now has to start again to identify a site and do a full Environmental Impact Assessment,” she said. As an interim measure two skips will be placed at the municipal yard next to the Fire Station and along Tarragona Road opposite Sea Vista respectively. Kouga Municipality is busy upgrading fire hydrants in St Francis Bay. Wednesday, 22 January 2014: Peter Crescent to Walton Road. Thursday, 23 January 2014: Shore Road and the continuation portion of Canal Road to Sea Glades Drive. The water supply will be shut down from 08:00 to 16:00 on the days mentioned. 1. The Oyster Bay – Humansdorp road is closed. 2. The Oyster Bay – St Francis road is open to 4x4s only, but 4×4 drivers are advised that the road is VERY slippery. 3. Johan Muller Boulevard in Paradise Beach, Jeffreys Bay, is closed. 4. The Loerie road is still closed due to the flooding of the causeways between the Gamtoos Ferry hotel and Loerie. The alternative road is the R330 that one would use to travel from PE to Hankey and Patensie. Please take care when driving over the weekend. The heavy rainfalls experienced over the past few days has caused more damage to the road infrastructure in all the towns in Kouga and more pot holes have appeared, particularly in St Francis Bay and Jeffreys Bay. Aapies Draai was closed yesterday afternoon to traffic and it still closed this morning. Aston bay residents have been particularly hard hit with the latest rains as Dolphin Drive as well as Swan Road (two of the main access roads) have huge potholes and have become unsafe to drive on, especially at night. Elsewhere in the Kouga, both roads to Oyster bay were closed yesterday due to the roads becoming dangerous for motorists to drive on. 7. Kwazulu Natal – ROAD CLOSED AGAIN KZN / Free State N3 Route, Van Reenens Pass – Snowfall. Die inwoners van Sea Vista het vir meer as agt jaar gewag vir die titelaktes. 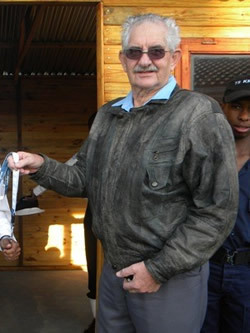 Raadslid Ben Rheeder het die titelaktes bekom en het so die inwoners gehelp om bewys van eienaarskap te bekom vir hulle huise.